3-way pan head: provides you with horizontal and vertical shoots, allows for tilt and swivel motion with the option of shooting landscape or portrait.With One year warranty from ZOMEi. This tripod is ideal for photographers who are looking for a lightweight and versatile tripod. Extended up to 140cm and collapses to 50cm, makes it ultra compact in size. weighs only 1.2kg, you can carry it anywhere you want. The included carrying case with shoulder straps provides safe storage and easy transportation. This compact tripod comes with an updated three-way photo head which is ideal for precise framing. Full panoramic becomes more easier with its 360-degree swivel function. Changing the orientation of the camera from portrait to landscape will never be an issue again. The quick-release mounting plate enables you to attach and detach your camera in seconds. Making fast transitions between shots and quickly moving from spot to spot possible. 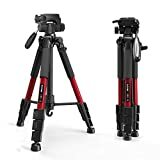 The 4-section legs of the tripod make it extremely compact, which also reduce the closed length of this tripod- a boon for any travelling photographer. The special designed lever locks allow for a more comfortable and stronger single-handed grip of the leg locks. They also offer more powerful locking of each section, meaning the tripod is more stable. This entry was posted in Discount Photography and tagged Canon, Carrying, Case, Digital, DSLR, Lightweight, Nikon, Portable, Sony, Travel, Tripod, Video, Video Camera, Zomei by Ball Photo. Bookmark the permalink.